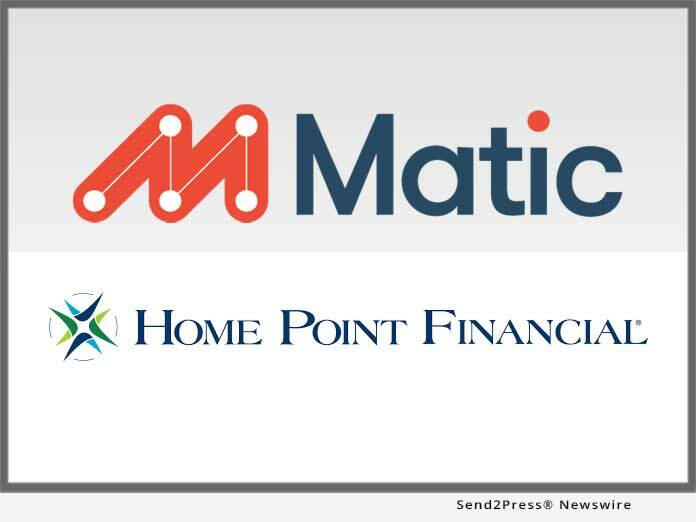 COLUMBUS, Ohio, Mar 26, 2019 (SEND2PRESS NEWSWIRE) -- Digital insurance agency Matic announced today that it has partnered with Home Point Financial Corporation ("Home Point"), a national, mortgage originator and servicer, to help its mortgage servicing customers find competitively priced homeowners insurance. Through the partnership, Matic will proactively analyze Home Point customers' current homeowners insurance coverage and identify individuals who could save money simply by switching to a different A-rated insurance carrier. Because Matic instantly shops for real-time rates with more than a dozen carriers, it can save homeowners an average of $517 on annual premiums. "At Home Point, we value the relationship we have with our customers," said Home Point COO Brian Brizard. "We constantly seek ways to improve their lives and their finances. Our partnership with Matic gives Home Point customers access to a fast and efficient way to insure their home with confidence." "Integrating homeowners insurance into the mortgage loan process is a win-win for Home Point's customers," said Matic Co-founder and CEO Ben Madick. "Matic helps Home Point stay connected with its customers in the best possible way - by providing a quick and potentially cost-saving way to find the right homeowners coverage for their mortgage loan." Matic is a digital homeowners insurance marketplace built for mortgage servicers and lenders. Matic's proprietary technology analyzes data from loan origination and servicing software to give homebuyers multiple policy options within seconds - without any manual data entry or lengthy questionnaires. With more than 20 A-rated carrier partners and industry-leading customer service ratings, Matic helps loan officers close deals faster and enables mortgage servicers to delight customers with an average of $517 in unexpected savings. For more information, visit https://matic.com or follow Matic on LinkedIn. Home Point Financial is a national mortgage originator and servicer. With the goal of providing a superior customer experience, Home Point has an innovative approach to lending, focusing on speed, quality and consistency for customers and partners. Home Point's operating philosophy is defined by the simple but very impactful statement - "We Care."